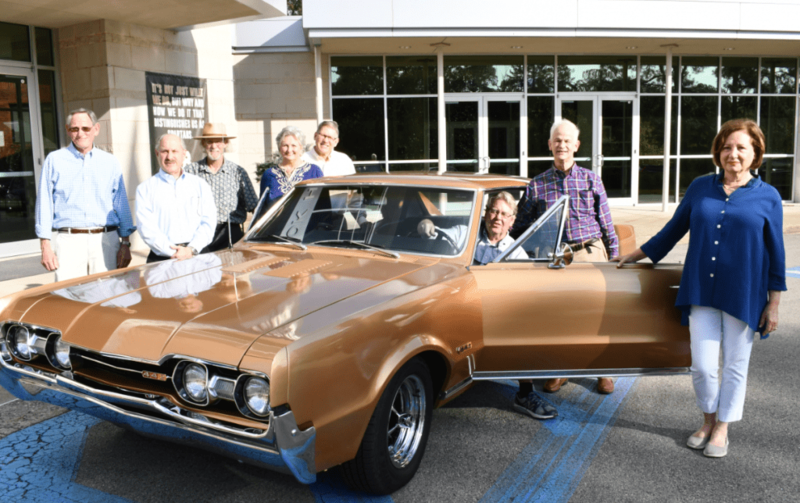 Several members of Mountain Brook High School class of 1969 gathered at the school last week to discuss plans for their 50th reunion on May 3 and 4. From left, Mark Coggin, Frank Siegal, Bill Tankersly, Charlotte Foster Coggin, Larry Johnson, Bobby Crook, David Aarons and Sarah Saunders Hodge. Journal photo by Jordan Wald. Members of Mountain Brook High School’s graduating class of 1969 are planning to kick off the summer with a 50th reunion on May 3 and 4. Among the list of transformative cultural happenings, an unassuming countryside in Upstate New York became the stuff of legend as top rock musicians of the era performed in the Woodstock Festival. While it wasn’t the stuff of national news, the Class of ‘69 played its part in the history of the Mountain Brook School System. The Class of 1968 lays claim to being the first Mountain Brook High School graduating class. But Class of ‘69 member Charlotte Coggin is quick to justify the importance of her class. Mountain Brook High School didn’t open until 1966, and the Class of ‘68 spent one year of high school at Shades Valley. Friendly rivalry may still exist between the two classes, but it is all in good fun. “We, along with the class of 1968, were privileged to choose our school colors, school motto, school fight song, our mascot, etc.,” Coggin said. MBHS continues to sport their choices, including the Spartan mascot and the colors green and gold. For the past eight months, preparations for the 50th celebration have been coordinated by a reunion committee chaired by Bobby Crook, including Coggin, David Aarons, Candy Abrams Berman, Rusty Boyd, Lindsay Cook, Sarah Saunders Hodge, Jane Howze Mann, Larry Johnson, Allison Lankford Morgan, Frank Siegel and Bill Tankersley. “We have appreciated all the support from Stephanie Maxwell, the outgoing executive director of the Mountain Brook City Schools Foundation,” said Coggin. On May 4, the class will tour the high school, accompanied by former teachers Fred and Ann Stephens and Judy Mills. A lunch at Billy’s Sports Grill at Liberty Park will follow. The weekend’s main event will be a party that night at The Club, complete with cocktails, class pictures, dinner and dancing to the old tunes, played by The Atlanta Party Band. Green and gold will abound, with decorations consisting of school memorabilia collected over the past 50 years, said Coggin. According to Coggin, the reunion celebration isn’t just for her class. Members of any MBHS graduating class from 1968 to 1970 are welcome to attend the dance portion of the party on May 4. Members of the 1959 graduating class of Shades Valley High School will be hosting a 60th Reunion on June 1. The festivities will be held at a private club in Vestavia Hills, beginning at 6 p.m.
Classmates interested in joining the celebration must reserve their tickets by April 30. Tickets are $75 each and can be paid by mailing a check to Shades Valley 60th Reunion, 2424 Hawksbury Lane, Hoover, 35226. For more information, email svhs59@gmail.com.